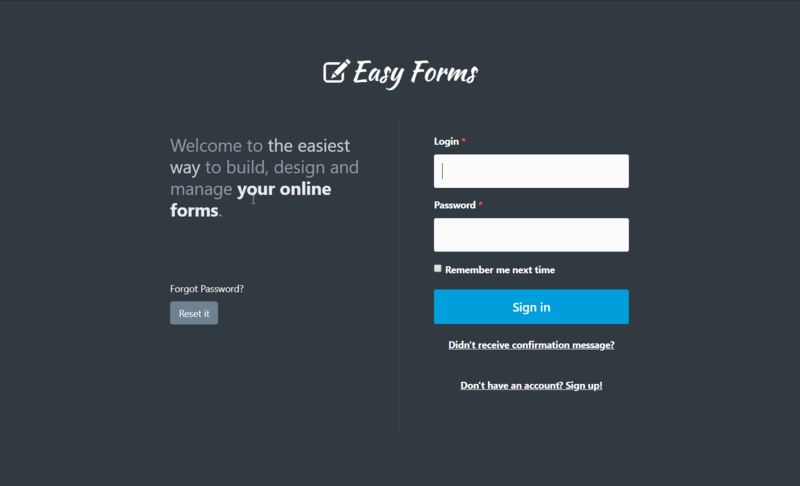 Easy Forms installation is a simple process that should not take more than a few minutes. 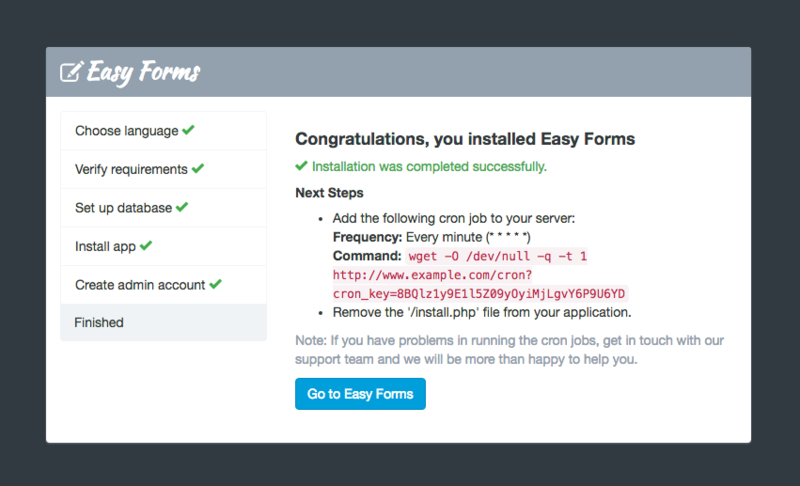 The following installation guide will help you to install Easy Forms on your server. Note: @app refers to the application installation path. With the following steps you will avoid problems (corrupted files) and reduce the upload time to a couple of minutes. 2. Upload the 'app.zip' file to your server. 3. Extract the 'app.zip' file. Note: This guide assumes that you have already uploaded the 'app' folder (Easy Forms files) to your server, but you can change its name or move all its files to another location. Tip! We suggest uploading the application files to a sub-domain, for example forms.example.com or app.example.com are good options. 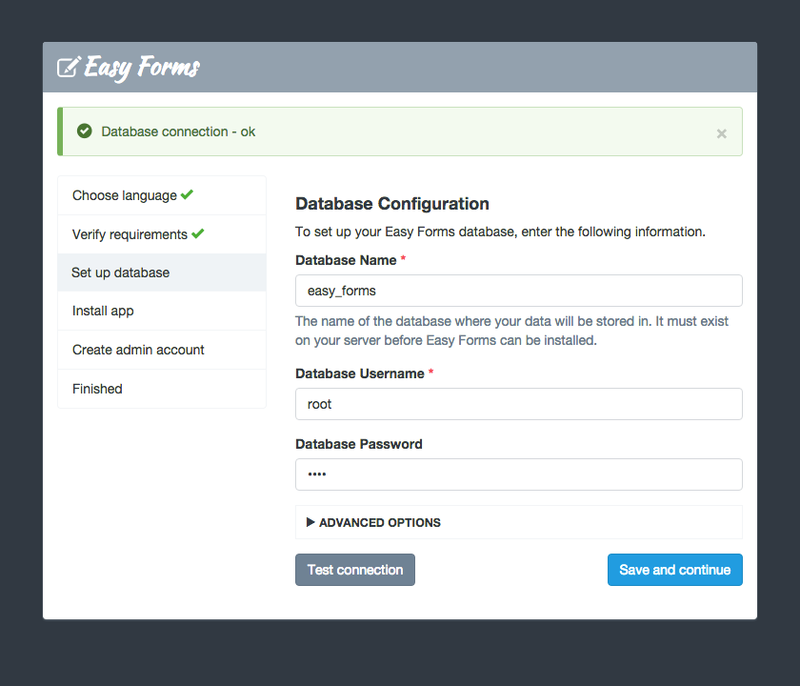 Easy Forms needs a MySQL database to store data such as forms, submissions and stats. You can either use your existing MySQL database or create a dedicated MySQL database for Easy Forms on your server. Take note of the username, password, database name, and hostname as you create the database. You will enter this information during the install. To run the install script, point your browser to 'install.php' file in the base URL of your application (e.g., http://www.example.com/install.php). 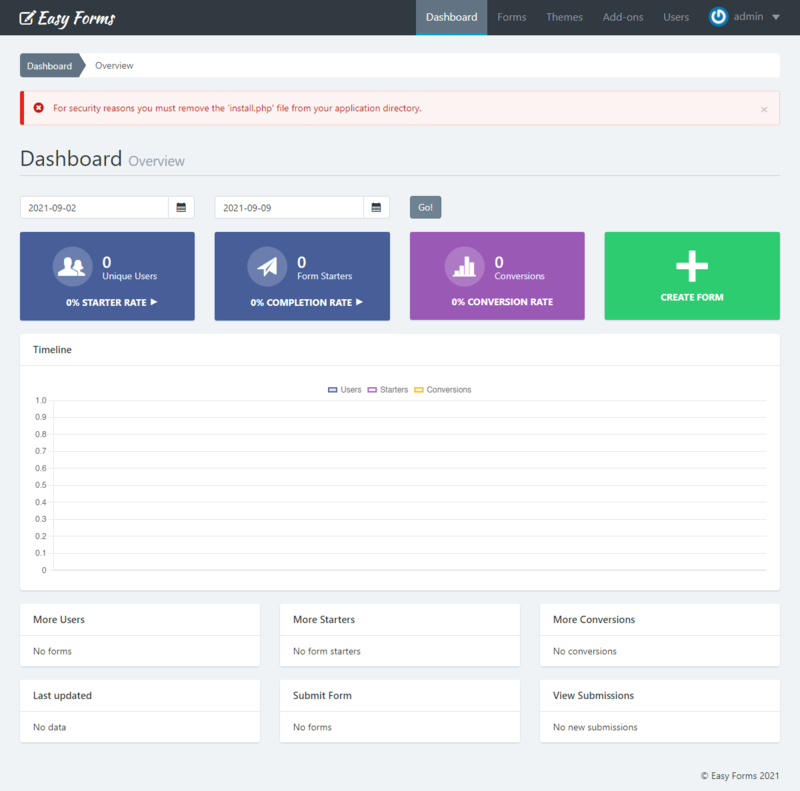 You will be guided through several screens to choose your language, set up the database and create the administrator account. To finish the installation process, the script will show you the command to configure your Cron Job. Important! For performance reasons the process to update Form Analytics is executed by the Cron Job. Tip! How to add the Cron Job on cPanel? Click here to read more. Note: If you have problems running the cron jobs, get in touch with our support team and we will be more than happy to help you. When the install script finishes, you can go to the application home page and it automatically will show the login form. If the form is not displaying properly and links on the page result in "Page Not Found" errors, you may be experiencing problems with friendly URLs. You must ensure you have the Apache module 'mod_rewrite' enabled. Through the FTP software or cPanel File Manager.